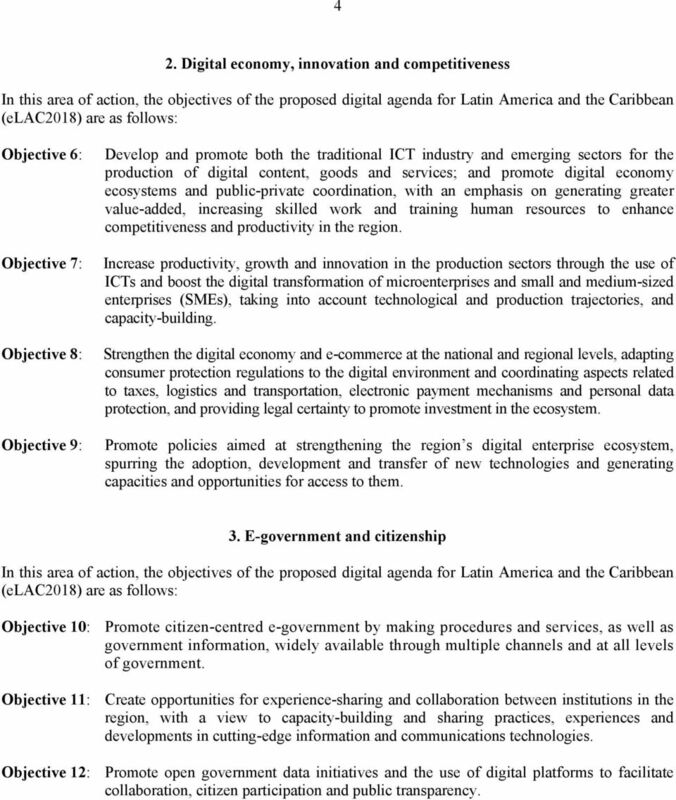 Download "DIGITAL AGENDA FOR LATIN AMERICA AND THE CARIBBEAN (elac2018)"
2 2 A. BACKGROUND 1. A regional dialogue was launched in 2000 on the information and knowledge society in Latin America and the Caribbean, in which the countries affirmed their willingness to design and implement programmes for access to and use of information and communications technologies (ICTs), which led to the Florianópolis Declaration. 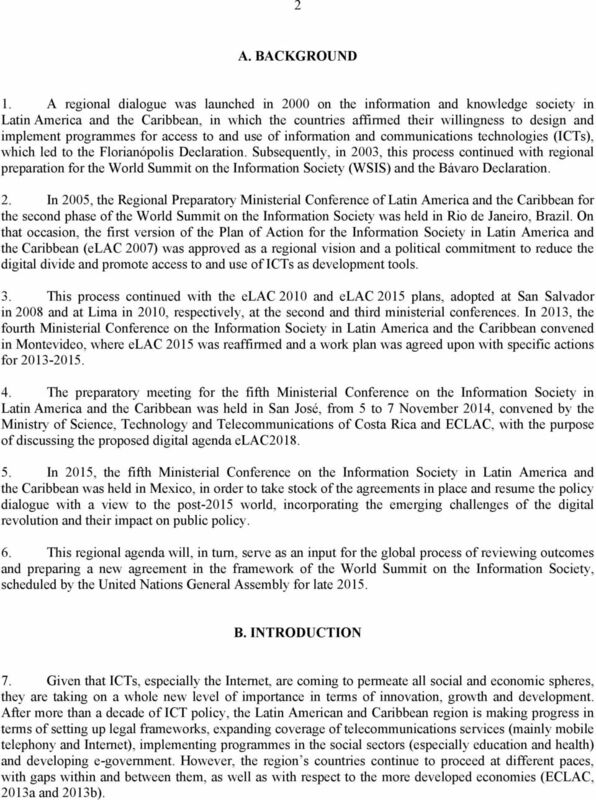 Subsequently, in 2003, this process continued with regional preparation for the World Summit on the Information Society (WSIS) and the Bávaro Declaration. 2. In 2005, the Regional Preparatory Ministerial Conference of Latin America and the Caribbean for the second phase of the World Summit on the Information Society was held in Rio de Janeiro, Brazil. 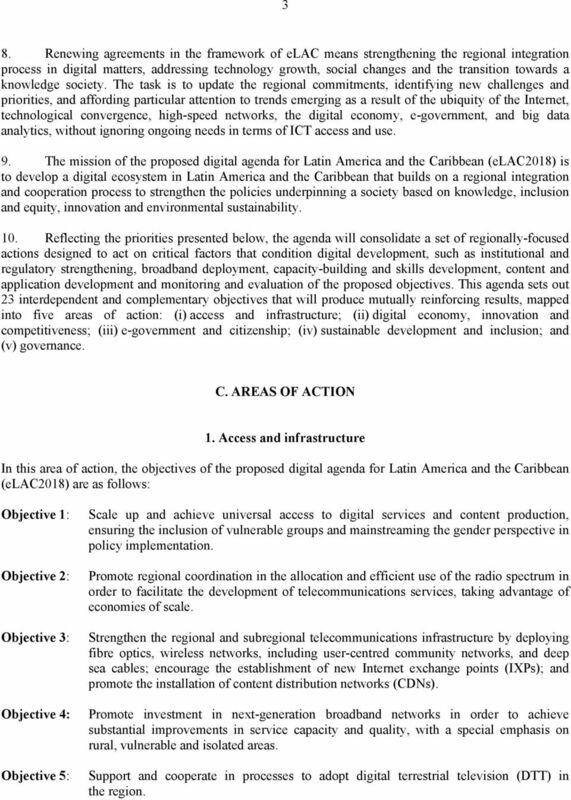 On that occasion, the first version of the Plan of Action for the Information Society in Latin America and the Caribbean (elac 2007) was approved as a regional vision and a political commitment to reduce the digital divide and promote access to and use of ICTs as development tools. 3. This process continued with the elac 2010 and elac 2015 plans, adopted at San Salvador in 2008 and at Lima in 2010, respectively, at the second and third ministerial conferences. 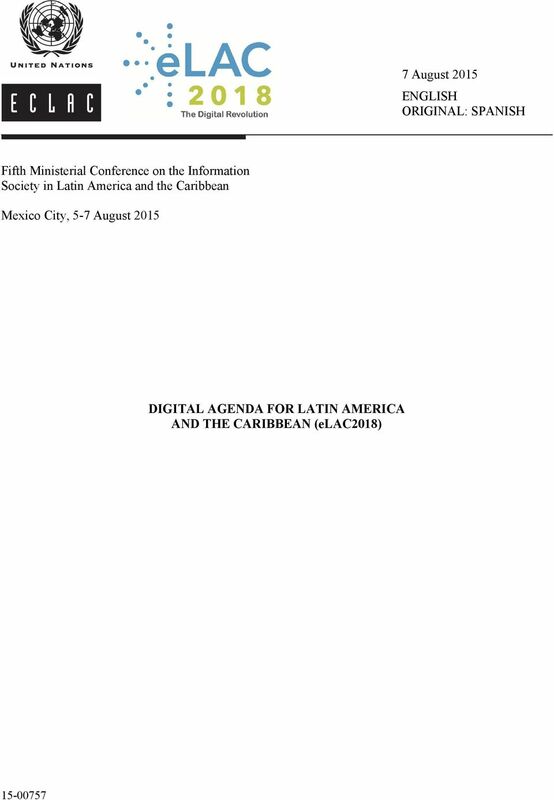 In 2013, the fourth Ministerial Conference on the Information Society in Latin America and the Caribbean convened in Montevideo, where elac 2015 was reaffirmed and a work plan was agreed upon with specific actions for The preparatory meeting for the fifth Ministerial Conference on the Information Society in Latin America and the Caribbean was held in San José, from 5 to 7 November 2014, convened by the Ministry of Science, Technology and Telecommunications of Costa Rica and ECLAC, with the purpose of discussing the proposed digital agenda elac In 2015, the fifth Ministerial Conference on the Information Society in Latin America and the Caribbean was held in Mexico, in order to take stock of the agreements in place and resume the policy dialogue with a view to the post-2015 world, incorporating the emerging challenges of the digital revolution and their impact on public policy. 6. This regional agenda will, in turn, serve as an input for the global process of reviewing outcomes and preparing a new agreement in the framework of the World Summit on the Information Society, scheduled by the United Nations General Assembly for late B. INTRODUCTION 7. Given that ICTs, especially the Internet, are coming to permeate all social and economic spheres, they are taking on a whole new level of importance in terms of innovation, growth and development. After more than a decade of ICT policy, the Latin American and Caribbean region is making progress in terms of setting up legal frameworks, expanding coverage of telecommunications services (mainly mobile telephony and Internet), implementing programmes in the social sectors (especially education and health) and developing e-government. However, the region s countries continue to proceed at different paces, with gaps within and between them, as well as with respect to the more developed economies (ECLAC, 2013a and 2013b). 3 3 8. Renewing agreements in the framework of elac means strengthening the regional integration process in digital matters, addressing technology growth, social changes and the transition towards a knowledge society. The task is to update the regional commitments, identifying new challenges and priorities, and affording particular attention to trends emerging as a result of the ubiquity of the Internet, technological convergence, high-speed networks, the digital economy, e-government, and big data analytics, without ignoring ongoing needs in terms of ICT access and use. 9. 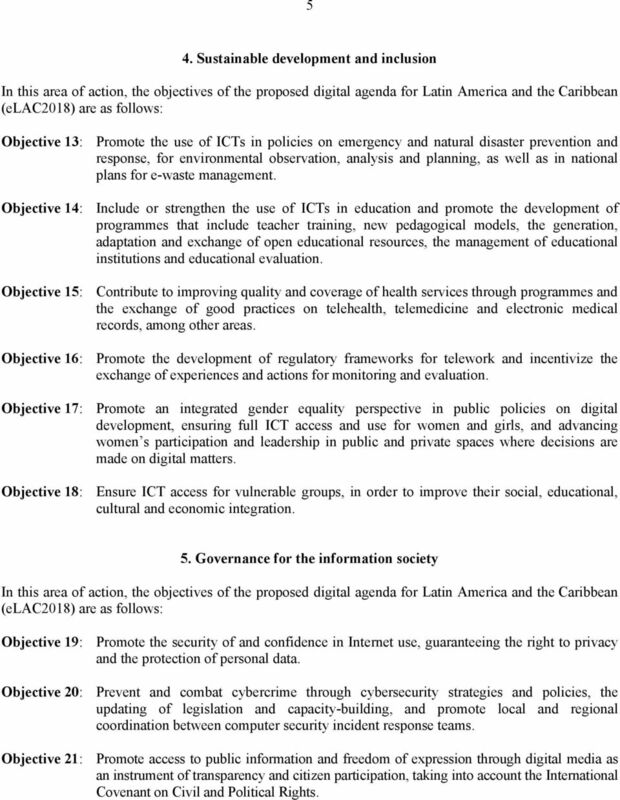 The mission of the proposed digital agenda for Latin America and the Caribbean (elac2018) is to develop a digital ecosystem in Latin America and the Caribbean that builds on a regional integration and cooperation process to strengthen the policies underpinning a society based on knowledge, inclusion and equity, innovation and environmental sustainability. 10. Reflecting the priorities presented below, the agenda will consolidate a set of regionally-focused actions designed to act on critical factors that condition digital development, such as institutional and regulatory strengthening, broadband deployment, capacity-building and skills development, content and application development and monitoring and evaluation of the proposed objectives. This agenda sets out 23 interdependent and complementary objectives that will produce mutually reinforcing results, mapped into five areas of action: (i) access and infrastructure; (ii) digital economy, innovation and competitiveness; (iii) e-government and citizenship; (iv) sustainable development and inclusion; and (v) governance. C. AREAS OF ACTION 1. Access and infrastructure Objective 1: Objective 2: Objective 3: Objective 4: Objective 5: Scale up and achieve universal access to digital services and content production, ensuring the inclusion of vulnerable groups and mainstreaming the gender perspective in policy implementation. Promote regional coordination in the allocation and efficient use of the radio spectrum in order to facilitate the development of telecommunications services, taking advantage of economies of scale. Strengthen the regional and subregional telecommunications infrastructure by deploying fibre optics, wireless networks, including user-centred community networks, and deep sea cables; encourage the establishment of new Internet exchange points (IXPs); and promote the installation of content distribution networks (CDNs). Promote investment in next-generation broadband networks in order to achieve substantial improvements in service capacity and quality, with a special emphasis on rural, vulnerable and isolated areas. Support and cooperate in processes to adopt digital terrestrial television (DTT) in the region. 4 4 2. Digital economy, innovation and competitiveness Objective 6: Objective 7: Objective 8: Objective 9: Develop and promote both the traditional ICT industry and emerging sectors for the production of digital content, goods and services; and promote digital economy ecosystems and public-private coordination, with an emphasis on generating greater value-added, increasing skilled work and training human resources to enhance competitiveness and productivity in the region. Increase productivity, growth and innovation in the production sectors through the use of ICTs and boost the digital transformation of microenterprises and small and medium-sized enterprises (SMEs), taking into account technological and production trajectories, and capacity-building. Strengthen the digital economy and e-commerce at the national and regional levels, adapting consumer protection regulations to the digital environment and coordinating aspects related to taxes, logistics and transportation, electronic payment mechanisms and personal data protection, and providing legal certainty to promote investment in the ecosystem. Promote policies aimed at strengthening the region s digital enterprise ecosystem, spurring the adoption, development and transfer of new technologies and generating capacities and opportunities for access to them. 3. E-government and citizenship Objective 10: Promote citizen-centred e-government by making procedures and services, as well as government information, widely available through multiple channels and at all levels of government. Objective 11: Create opportunities for experience-sharing and collaboration between institutions in the region, with a view to capacity-building and sharing practices, experiences and developments in cutting-edge information and communications technologies. Objective 12: Promote open government data initiatives and the use of digital platforms to facilitate collaboration, citizen participation and public transparency. 5 5 4. Sustainable development and inclusion Objective 13: Promote the use of ICTs in policies on emergency and natural disaster prevention and response, for environmental observation, analysis and planning, as well as in national plans for e-waste management. Objective 14: Include or strengthen the use of ICTs in education and promote the development of programmes that include teacher training, new pedagogical models, the generation, adaptation and exchange of open educational resources, the management of educational institutions and educational evaluation. Objective 15: Contribute to improving quality and coverage of health services through programmes and the exchange of good practices on telehealth, telemedicine and electronic medical records, among other areas. Objective 16: Promote the development of regulatory frameworks for telework and incentivize the exchange of experiences and actions for monitoring and evaluation. Objective 17: Promote an integrated gender equality perspective in public policies on digital development, ensuring full ICT access and use for women and girls, and advancing women s participation and leadership in public and private spaces where decisions are made on digital matters. Objective 18: Ensure ICT access for vulnerable groups, in order to improve their social, educational, cultural and economic integration. 5. Governance for the information society Objective 19: Promote the security of and confidence in Internet use, guaranteeing the right to privacy and the protection of personal data. Objective 20: Prevent and combat cybercrime through cybersecurity strategies and policies, the updating of legislation and capacity-building, and promote local and regional coordination between computer security incident response teams. Objective 21: Promote access to public information and freedom of expression through digital media as an instrument of transparency and citizen participation, taking into account the International Covenant on Civil and Political Rights. 6 6 Objective 22: Coordinate, among the countries of Latin America and the Caribbean, participation in Internet governance, reinforcing regional mechanisms and promoting synergies between them; foster the development of multi-stakeholder dialogue forums or national mechanisms, to include governments, the private sector, civil society, the technical community and academia, and their coordination at the regional and global levels. Objective 23: Promote the measurement of access to and use of ICT at the national and regional levels, by strengthening the institutional frameworks needed to coordinate, monitor, measure and promote digital policies, ensuring the regular production of data and statistics on ICTs, in conformity with international standards and fostering close collaboration between institutions responsible for national digital agendas and national statistical agencies. TELECOMMUNICATIONS SERVICE PROVIDERS ASSOCIATION OF KENYA (TESPOK) BACKGROUND TESPOK is a professional, non-profit organization representing the interests of telecommunication service providers in Kenya. Ongoing ITU research suggests that at present, around 43% of national strategies reference youth. Cyber Stability 2015 Geneva, 09 July 2015. African Union Perspectives on Cybersecurity and Cybercrime Issues.